In October 1999, I was interviewed by Leo Laporte on ZDTV’s ‘Call for Help’ programme. Yes, this is just another interview about the Trojan Room Coffee Pot, but it’s interesting to me for several reasons. Secondly, it was quite a challenge to do the recording. They sent me a camera in advance, and I had a slightly older PC which didn’t have the brand new USB ports that were just starting to appear, so I had to dismantle it, install an ISA card, and then repartition my hard disk and install Windows 95, because neither the Linux nor the Windows NT operating systems I had on there were supported by 3Com’s software. Just before Christmas, Tilly (my spaniel) and I went to the Dordogne and back in our campervan. I made a video about it, which, while it may be of interest only to travel vlog and ‘van life’ enthusiasts, does have a bit of novelty value, because I filmed it on a spherical (360-degree) camera. This means that after you’ve watched it, you can go back and watch it again from a completely different angle and see what was happening behind you! This was really just an experiment for me, and I learned a great deal about the challenges and opportunities of filming and editing this particular medium, which I may write about in due course. This is a lovely idea – the Mixergy hot water tank. A standard UK hot water tank heats the water from the bottom, either using electricity or water heated by a gas boiler. This means that when you want to heat up your water, you need to heat the whole thing. Mixergy, instead, put the heating at the top, so you can warm up smaller amounts of water, and then make intelligent use of pumps to circulate it as required if you need to heat larger amounts of water. Not only is this more energy-efficient, but it means you get hot water again more quickly after you’ve used it up. There’s a more detailed discussion on a recent episode of Fully Charged. Fancy some fast, green, silent, smooth, aquatic transport? Me too. So the approach taken by SeaBubbles is really attractive. They’re making electric hydrofoils which, once you get above about 6 knots, rise up and lose 60% of their drag. They’re about the same size as a car, and the battery has the same capacity as my BMW i3. This would give you enough range, on their figures, to get you across the English Channel. They haven’t announced pricing yet, but I fear they’d be well beyond my reach, especially since I’d also need to buy a cottage by the side of a fjord to appreciate it fully. But I hope I get a chance to ride in one! On Wednesdays, there’s an interesting group of catering vans that collect at the far end of the West Cambridge campus, and I like to go there for lunch. 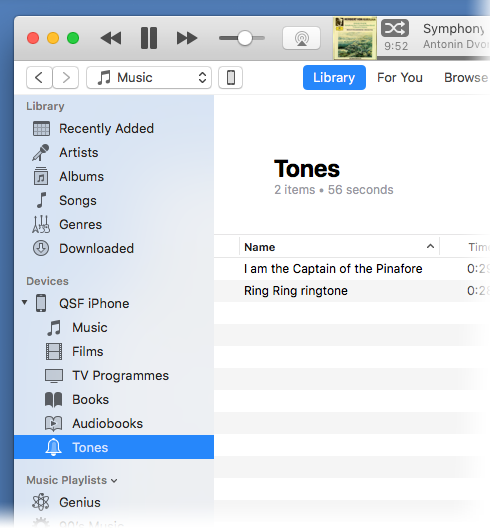 I lost this, though, in a recent wipe and re-install of my phone, after which I discovered that iTunes no longer makes it at all obvious how to put these custom ringtones onto your device. It’s easy if you buy them on the iTunes store, of course, but otherwise no amount of dragging and dropping would get my old favourites into iTunes or onto my phone. Go and find your ringtone(s) in the Finder or Windows Explorer and COPY them. 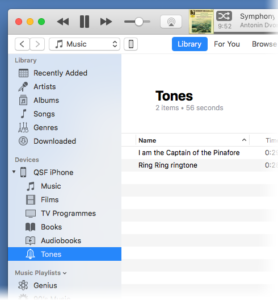 Select the ‘Tones’ section of your device in iTunes and PASTE. This works fine for me in iTunes 12.7 – no dragging and dropping needed. You should then see your ringtones, and be able to choose them in Settings > Sounds on the iPhone. They used to say that there are two ‘internet of things’ systems that ‘just work’ out of the box: the Sonos sound system, and Philips Hue lighting. I’m fortunate enough to own both of them, and I would add the Honeywell Evohome heating system (though one of my friends has had a few complications with an unusually large installation). And then I did a little research and realised something that I should have thought about earlier. 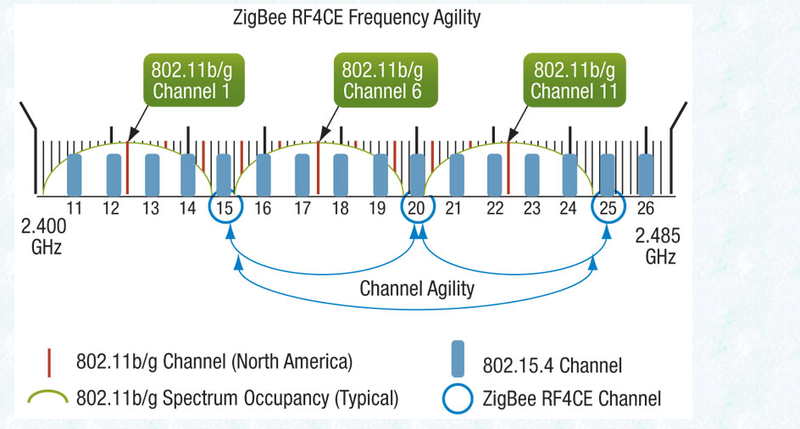 ‘802.11b/g’, in case you don’t know it, is part of the technical standard popularly known as Wifi, so the green labels show Wifi channels, and the blue bars show Zigbee. The number and availability of channels vary depending on your country, but they will be similar to the above. Although Wifi has about a dozen channels, the nearby ones overlap substantially, so most installations only use 1, 6 or 11: if both you and your neighbour are using Wifi channel 1, you won’t make much difference by switching to 2 or 3; you need to go at least as far as 6. Go much further than 6, and you’ll start interfering with your other neighbour on channel 11. Usually, these days, wifi routers are pretty good at picking their channel by finding the least congested space, though you may need to reboot them from time to time to encourage them to do so. Anyway, one thing that had changed in my new house was the Wifi. And when I looked, sure enough, my Wifi router was on channel 11 and my Hue hub was on a Zigbee channel that was rather too close for comfort. By going into the Hue app and looking at the settings for my Bridge, I was able to change the Zigbee channel to number 15, and things are going a lot more swimmingly now! Update: As Nigel points out in the comments, if you have 5GHz wifi available, moving as many of your devices as possible to that will also help! I think this is wonderful. Today I got to play with Gareth Bailey’s Space Invaders game – a quick hack, he claims, which he put together yesterday. This uses an oscilloscope as an X-Y plotter to draw the graphics, harking back to the earliest days of computer displays. But historically, displays like this would usually have been driven by a mainframe, where as Gareth’s is driven by a Raspberry Pi. And where do you get a couple of nice analog outputs from a Raspberry Pi? Why, from the left and right channels of the audio, of course…. Apologies for the quality of the video, but I thought this was worth capturing despite the challenging environment! Sean Riley creates the Computerphile YouTube channel, which has clocked up nearly a million subscribers, and produces some great stuff, especially for the geeks among us. I had fun talking to him about the early days of the Trojan Room Coffee Pot. 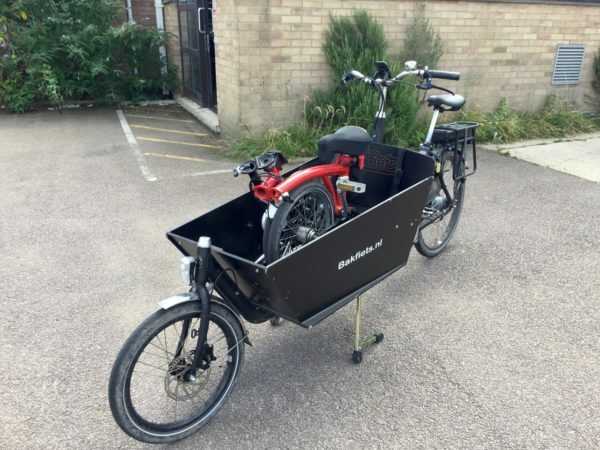 What better way to carry a bicycle than in another bicycle? Someone who wasn’t quite so sure about the whole idea was my spaniel Tilly, but once she settled down, it was a great way to transport her to one of her favourite walking spots, about 3 or 4 miles away, against a strong headwind, and bring her back afterwards. 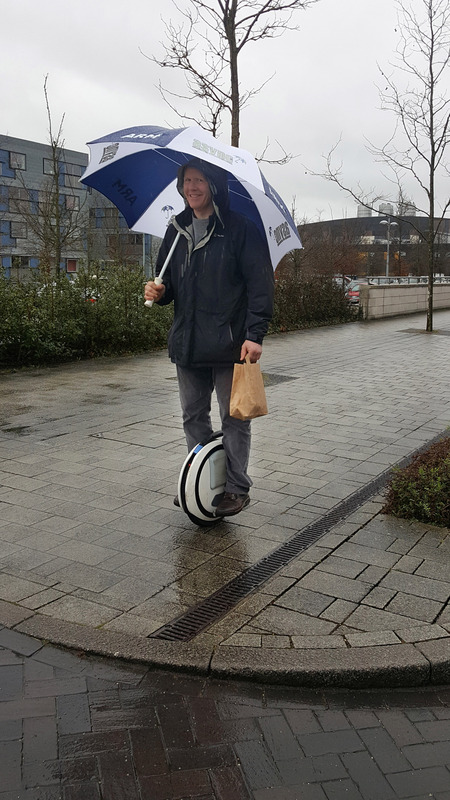 Since I last wrote about electric unicycles, I’ve commuted in to work a couple more times, and have used it to zoom around the West Cambridge campus in search of decent coffee. I still only get to play on it for about 15 mins per week, but it’s good fun!